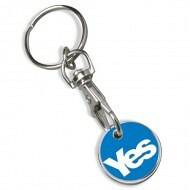 Yes Scotland trolley coin keyring, originally uploaded by Scottish Political Archive. Yes Scotland were one of the Yes campaign groups for the 2014 referendum. The campaign was launched on Friday 25th May 2012 at Cineworld, Fountain Park, Edinburgh.